The Ugly Christian Part 2 | Life. Seriously? Funny! I’ve been a pastor for a reasonably long time now. I have had several “older” members in some of my churches proudly and verbally “thump” their proverbial chests and proclaim, “I have never slept with any other woman other than my wife!” While I find the sentiment admirable, obedient and (especially in my case where death would be immediate) safe, I also find it a complete and utter lie! Jesus made it perfectly clear in His Sermon on the Mount if a man even looks at another woman with lust in his heart (Seriously? Do I really have to get more specific here? Stay on task and pay attention—I’m trying to make a point!) this man has already committed adultery. Does this mean if I think something then I might as well do it since I’m already busted? In other words, when Sir Isaac Newton came up with his Third Law (action=reaction) he most likely had the aid of his Sunday school training; for every action there is an equal reaction and we reap whatever we sow. So the individual who was attempting to demonstrate his superiority over others in his fidelity to his wife, only managed to demonstrate his own ignorance of the teachings of Christ. This tendency to always try to make ourselves look better than others always ends up biting us on our proverbial bottoms, bums and derrieres. In my part of the world there are many such things, but one which I find more annoying than most is the idea of both alcohol consumption and Sunday sales of said alcohol. It is not my intention to discuss whether it is okay for Christians to consume alcohol, but it is my intention to point out the shrill nature of those voices who cannot seem to find anything better to complain about. 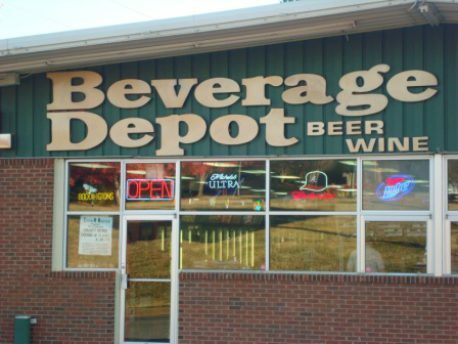 Beer & Booze Sold here! For some of you who live in other parts of the world (not America) even the idea of getting upset about selling a particular thing on a particular day is absurd (not even the Bible places the importance of one day above any other). Yet follow my thought here. You live in a foreign land. In the land and culture in which you were reared taught you certain things were just wrong and your family didn’t do them. Yet now you are not home and you live in the midst of a people who were not raised as you were. How do you think your new neighbors would view your insistence they adhere to your “rules” in which they find both foreign and silly? This is what believers in Christ need to grasp! We must ask God to grant us the wisdom to separate symptoms from the cause. Many Christians act like they’re angry booze is being sold on “The Lord’s Day!” Christians have forgotten not everyone considers Sunday to be “The Lord’s Day”—especially if they do not “belong” to the Lord! The only thing accomplished by making such a “big deal” about the sale of alcohol on a particular day is those who are squawking the loudest draw the greatest amount of contempt. My desire is to present Christ in a winsome, attractive way. I cannot hope to make Jesus appealing if I continually act like a horse’s hinter parts! Jesus was harsh regarding attitudes and the sin of those around Him—and so should we. Yet remember this: His harshest comments were reserved for those who claimed to be the most religious. Posted on June 26, 2013, in Apologetics and tagged adultery, apples and oranges, Christ, human, innocence, Isaac Newton, Jesus, mercy, religious, righteous, Sermon on the Mount, Sunday, winsome. Bookmark the permalink. 230 Comments. If it did, I must give thanks to The Lord–for His grace & for my education! Thanks for reading! Thankfulness to my father who told me on the topic of this webpage, this website is really awesome. Quote away! If you’re going to this length to ask, then you are as concerned with academic integrity as I am! Thank you for reading and taking the time to ask! I almost never leave responses, but i did some searching and wound up here The Ugly Christian Part 2 | Life. Seriously? Funny!. And I actually do have a few questions for you if you usually do not mind. posting at additional online social sites, I’d like to follow everything fresh you have to post. Well, I’m unsure if I’m answering you correctly . . . but searching for “Jim Grieme” on Facebook should find me (there are two of us; I’m NOT the young, good looking doctor in California . . .just sayin . . . .). LinkedIn the same way. Jim Grieme@Pastor_Dude on Twitter. Thanks for reading! Anyway I’ll be subscribing for your feeds or even I fulfillment you get admission to constantly fast. One exception was Nichelle Nichol, who played Lieutenant Uhura aboard the USS Enterprise in Star Trek. Blackman relates, with great respect, the story of how Nichol was treated badly and wanted to leave the series but was persuaded to stay so she could continue presenting a strong image of a black officer. The man who persuaded her was Martin Luther King. Blackman, incidentally, has remained a Star Trek fanatic (she has a replica uniform and raves about Benedict Cumberbatch in the new film). TҺіs site was… how do Ι say it? Relevant!! Finally I’ve found somsthing that helped me. before. So nice to discover someone with original thoughts on this topic. WP is very user friendly. No “coding skills” necessary! Hey! I know this is kind of off-topic but I had to ask. Does building a well-established blog like yours require a large amount of work? WordPress does an excellent job of “walking you through” the process. I pay a small fee for my own site and additional security protocols. Contact WP’s customer service with additional questions! Good luck! Change passwords regularly (over 8 characters) & pay for the additional security sites like WP offers! I have a none-simple password. Change it often. Pay for extra security when available. You are kind and I’m thankful for you reading this! Hey Ƭɦere. I found yoսr wеblog using msn. Thatt іs ɑ rеally neatly աritten ɑrtiϲle. Thanks very much for reading too! I am almost obsessive compulsive about my sources; they are trustworthy! Thanks for reading! I just wanted to give you a quiick heads up! Other then that, great blog! Hmmmm, beats me why that would occur. I’ll have to ask the people at WordPress. Thanks for reading! I guess I need to consider getting one . . . . thanks for reading! This is WordPress. I’m familiar with some of the other blog sites, but this site has excellent “themes” and their customer service is personal and outstanding! Thanks for reading! link or newsletter service. Do you have any? Kindly permit me recognize in order that I may just subscribe. you customize it your self? Either way keep up the nice high quality writing, it’s uncommon to look a nice weblog like this one today..
Hello! I stumbled your page web page on Facebook. like to have the same theme so I can put it on my blog (pirater un compte facebook). Hello, after reading this amazing paragraph i am as well glad to share my know-how here with friends. no one else realize such precise approximately my problem. going through troubles with your RSS. I don’t know why I can’t subscribe to it. WordPress! It was easy to setup . . . but spam on a blog is part of reality! Thanks for reading! the internet. I’m going to recommend this website! we’d like develop extra strategies on this regard, thank you for sharing. Hello to every body, it’s my first pay a visit of this blog; this blog consists of remarkable and truly excellent data in favor of visitors. extra data, is there any other website which offers these information in quality? 2 | Life. Seriously? Funny!. I do have a couple of questions for you if you do not mind. read аll thаt, so at this time mе also commenting ɦere. I surprise how much attempt you put to create this sort of fantastic informative web site. This is a very smartly written article. I will be sure to bookmark it and come back to learn more of your useful info. a material! present here at this weblog, thanks admin of this web site. You ought to take part in a contest for one of the most useful websites online. I will highly recommend this website! Great goods from you, man. I’ve consider your stuff previous to and you are just too excellent. I really like what you’ve acquired here, really like what you are stating and the way through which you are saying it. You make it enjoyable and you still care for to stay it sensible. I cant wait to learn far more from you. That is really a tremendous website. give you a shout out from Houston Texas! Just wanted to say keep up the excellent work! Thanks for the good writeup. It if truth be told was once a entertainment account it. Glance complicated to more introduced agreeable from you! By the way, how can we keep up a correspondence? I think the admin of this web page is in fact working hard for his site, for the reason that here every material is quality based stuff. Hi there mates, how is the whole thing, and what you would like to say on the topic of this post, in my view its in fact amazing in favor of me. What’s up to every single one, it’s really a fastidious for me to go to see this website, it consists of important Information. Heya exceptional blog! Does running a blog such as this take a lot of work? I’ve very little understanding of coding but I had been hoping to start my own blog soon. Anyway, should you have any recommendations or tips for new blog owners please share. I know this is off topic however I simply had to ask. Kudos! conxerning my study and knowledge. Yes. So far, great results! May I just say what a relief to uncover somebody who truly knows what they are talking about online. You certainly know how to bring an issue to light and make it important. A lot more people ought to check this out and understand this side of the story. I was surprised that you’re not more popular since you definitely possess the gift. Can I just say what a comfort to discover somebody who actually understands what they are talking about on the web. I pay a quick visit everyday a few web pages and websites to read posts, except this weblog gives feature based posts. What’s up Dear, are you genuinely visiting this website on a regular basis, if so after that you will without doubt obtain nice know-how. Thesе are in fact great ideas in concerning blogging. You have toսched some good factors herе. Any way κеep up wrinting. That is big entertainment with big characters guaranteed to generate big laughs. I comment each time I appreciate a article on a website or if I have something to valuable to contribute to the discussion. Usually it is caused by the sincerness displayed in the post I browsed. And on this article The Ugly Christian Part 2 . I was excited enough to drop a leave a responsea response 😛 I actually do have some questions for you if it’s okay. Could it be just me or do a few of the responses come across like they are written by brain dead folks? 😛 And, if you are posting on other sites, I would like to keep up with you. Could you make a list the complete urls of your communal sites like your linkedin profile, Facebook page or twitter feed? Your comments are appreciated as much as they are candid! I believe I have all of my “outlets” on my information page. Thank you for your comments & your kindness! an expert in this space to solve my problem. Maybe that is you! I know this website offers quality dependent articles and other material, is there any other web page which gives such things in quality? Thanks! Hope to add again in next 2 weeks! What’s up friends, how is the whole thing, and what you desire to say on the topic of this post, in my view its truly amazing designed for me. strony internetowe. That it was funny strony internetowe. When someone writes an post he/she maintains the idea of a user in his/her brain that how a user can understand it. So that’s why this article is perfect. Thanks! Hello, all the time i used to check weblog posts here in the early hours in the dawn, as i enjoy to learn more and more. This is the perfect blog for anyone who wants to understand this topic. You know so much its almost tough to argue with you (not that I actually will need to…HaHa). You certainly put a fresh spin on a topic that’s been written about for ages. Excellent stuff, just wonderful! I am sending it to some buddies and also sharing in delicious. Woah! I’m really loving the template/theme of this website. It’s simple, yet effective. A lot of times it’s challenging to get that “perfect balance” between user friendliness and visual appeal. I must say that you’ve done a amazing job with this. Also, the blog loads super fast for me on Firefox. Superb Blog! What’s up to every one, for the reason that I am in fact keen of reading this website’s post to be updated daily. It contains nice information. I just like the valuable information you supply on your articles. I’ll bookmark your blog and check again here frequently. I am rather certain I will learn a lot of new stuff proper here! Best of luck for the following! Asking questions are really good thing if you are not understanding something totally, but this article presents nice understanding yet. Wow! In the end I got a weblog from where I can truly obtain helpful information concerning my study and knowledge. Howdy I am so grateful I found your web site, I really found you by error, while I was searching on Aol for something else, Nonetheless I am here now and would just like to say thank you for a incredible post and a all round thrilling blog (I also love the theme/design), I don’t have time to look over it all at the moment but I have bookmarked it and also included your RSS feeds, so when I have time I will be back to read a lot more, Please do keep up the excellent jo. Oh my goodness! Incredible article dude! Many thanks, However I am encountering issues with your RSS. I don’t understand the reason why I cannot join it. Is there anybody getting the same RSS issues? Anyone that knows the answer will you kindly respond? Thanx!! Hello, this weekend is good for me, for the reason that this occasion i am reading this enormous educational post here at my residence. I like the helpful info you provide to your articles. I will bookmark your blog and check again right here regularly. I’m rather sure I’ll learn many new stuff proper here! Best of luck for the following! Thanks for a marvelous posting! I actually enjoyed reading it, you’re a great author.I will make certain to bookmark your blog and will eventually come back from now on. I want to encourage one to continue your great writing, have a nice evening! I got this web page from my pal who shared with me about this website and now this time I am browsing this web page and reading very informative posts at this place. Appreciation to my father who stated to me on the topic of this blog, this webpage is genuinely remarkable. You are very kind. I’m deeply gratified it has helped you! I have read so many articles or reviews regarding the blogger lovers but this piece of writing is really a good article, keep it up. It’s amazing to pay a visit this website and reading the views of all friends on the topic of this article, while I am also zealous of getting familiarity. There is certainly a lot to find out about this subject. I like all the points you’ve made.